SACRAMENTO (Scrap Monster): The Sacramento City Council is planning to consider a review on Tuesday on the ordinance that proposes ban on single-use plastic bags from certain grocery stores. The ordinance also calls for 10-cent fees on paper and reusable bags. A voting on the ordinance is expected to take place before March 31st. 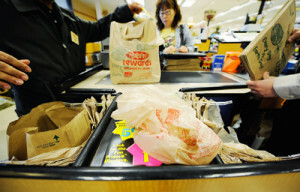 According to report published by the City, around 130 jurisdictions in California including Davis, Nevada City, Chico, Truckee and South Lake Tahoe have imposed ban on use of single-use plastic bags. Meantime, the proposed state-wide ban on plastic bags by California has been put on hold Tuesday, further to confirmation by state election officials that a trade group has managed to obtain enough signatures to refer the bill to a referendum ballot in 2016. Mayor Kevin Johnson stated that the City would push for the ban. The proposed ban would be applicable for grocery stores, pharmacies and convenience stores. Estimates by California vs. Big Plastic campaign committee indicate that Sacramento City consumes nearly 13 million plastic bags every month. Further, these bags pollute parks and rivers and pose threat to wild life. The City further clarified that the City’s ban on plastic bags would remain even if the state wide ban is overturned by a successful Nov ’16 referendum. If approved, the ban would go effective Jan 1st, 2016.